Part of my gig with NBCSports.com involves doing call-in segments on shows and even being on camera for weekly videos, but I actually got into writing in part because it doesn't involve much talking. My hesitance to stray from the written word has caused me to stupidly turn down all kinds of radio interview requests in the past, but when Doogie Wolfson asked me to co-host Sunday night's "Twins Weekly" show on KFAN, there's no way I could resist. For some reason I get incredibly nervous doing phone interviews, but I'm hoping that actually being in the KFAN studios for the show will calm my nerves a bit. Plus, Doogie and I go so far back that I knew him when he was just "Darren." He used to come over to my old house in St. Paul, immediately sit down at the kitchen table, and tell my mom to make him a sandwich. Oddly, his calling her "Mrs. Gleeman" made the whole thing seem sort of charming back then. Anyway, Doogie and I will be talking Twins on KFAN from 5:30 to 6:30 Sunday night and I'm told that we'll be joined at some point by the Official Twins Beat Writer of AG.com, LaVelle E. Neal III. It should be interesting one way or another, so feel free to listen and perhaps even call in. If it doesn't go so horribly that I immediately try to eliminate all evidence of the show existing, I'll try to get a copy of the audio to post here Monday. Speaking of the Twins, their 1-0 loss to the Royals yesterday afternoon wasn't on television locally, but I had the misfortune of being able to watch the miserable game on MLB.com. Matt Garza dropped to 1-3 despite a 1.70 ERA, which is the type of run support that makes even Johan Santana and Carlos Silva feel sorry for him. In the middle of the offensive pack at the All-Star break, the Twins now rank 12th among AL teams in scoring. The lineup has produced a pathetic 3.1 runs per game in the second half, which ranks dead last among all 30 major-league teams by a wide margin. Yesterday was the 11th time in 114 games (9.6 percent) that the Twins have been shut out and the 33rd time (28.9 percent) that they've been held to zero, one, or two runs, which is amazing given that they faced a starting pitcher, Kyle Davies, who came into the game with a 6.26 ERA in 240 career big-league innings. Sadly, this season is starting to look an awful lot like 2005. Garza had an interesting quote following the loss, saying: "I shouldn't have given up that run or we'd still be playing." Probably true, although not in the spirit Garza meant it. A St. Paul man, complaining of chronic pain, wanted to have his testicles removed. When conventional medical staff refused to do the job, he hired other "professionals" to take off his testicles, according to a search warrant affidavit filed Monday in Ramsey County District Court. The mere chance to pen an article that begins with a paragraph like that almost makes me want to go back to journalism school. Almost. Speaking of journalism school, one of my favorite teachers (and people, period) from my time there, Pamela Hill Nettleton, had an editorial piece in the Star Tribune earlier this week. I'm not sure if it's more upsetting that former Official Fantasy Girl of AG.com Jessica Alba may have slept with Derek Jeter or ... well, read this. Speaking of women Jeter has dated, sites like this one are apparently keeping Jessica Biel from getting naked in a movie, which is the best argument for shutting down AG.com that I've ever heard. 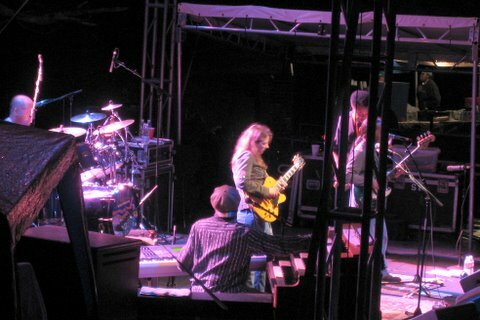 Last Saturday night I went to the Susan Tedeschi concert at the Minnesota Zoo, which was part of the annual Music in the Zoo series that brings in some relatively big names to play at a 1,500-seat outdoor amphitheater. Despite a little rain and what was probably the worst weather this summer, seeing her live was amazing. I was already a huge fan of Tedeschi's music, but she was far better than I could have imagined and put on easily the best concert I've ever seen. Tedeschi took advantage of the somewhat intimate setting by bantering with the audience and seemed to genuinely be having a good time on stage, asking the crowd where "Bob Zimmerman" grew up before she did a cover version of "Don't Think Twice, It's All Right" and laughing at the group of a couple dozen middle-aged fans who decided to storm the front row in order to dance. Oh, and she sounded absolutely spectacular. Tedeschi's huge, soulful voice belting out song after song was made even more amazing by the fact that her girlish speaking voice is the complete opposite and she ended most songs with a mouse-like "thank you." 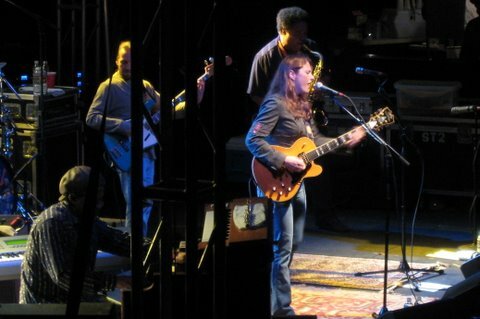 Her band, which she informed the crowd was borrowed from husband Derek Trucks, sounded great too, and they did a long set that would have been even longer if the venue hadn't forced them off stage because of a curfew. It was as good as a live performance can get. If you get a chance to see her live, I highly recommend it. UPDATE: After taking a beating in last week's Link-O-Rama, Rotoworld football boss Gregg Rosenthal used my musical taste (once more or less accurately described as being identical a 17-year-old girl's) as a means to fire back via his own blog. I sense a WWE-style feud brewing and I'm fully prepared to fight to the death to protect the honor of both Tedeschi and AG.com. Especially since I'm roughly twice Mr. Pancake's size. Not since Luis Rivas has seeing someone wearing a Twins hat been this upsetting. The footage that started it all. Yes we are Twins fans, but certainly not fans of the socialistic-left whacko leaning Star and Tribune. Sorry you feel it necessary to tout for the extreme left bias of this newspaper. I enjoy your baseball articles and insight..however, with your pushing the Strib, one must wonder what bastion of whacko left journalism you were exposed to. and how it may taint your sports reporting and opinions. Tragic about the bridge collapse. Next time you view the coverage, note the stone arch bridge still standing after eighty years built when this was a conservative thinking state. And the damaged mess created and allowed by the liberals in 1967. That's the entire note, unaltered. I'm pretty sure it stands on its own just fine, so I'll leave it at that. Pre-orders have started for The Hardball Times Baseball Annual 2008, which will hit stores on December 1. After editing and contributing to the first three THT annuals, I'm sad to say that I have zero involvement in this year's edition. However, Dave Studenmund has put together a fantastic lineup of writers, including Bill James, Will Leitch, John Dewan, David Vincent, and THT's regular cast of thousands. I can now say without bias that it's a book every baseball fan should own. Speaking of The Hardball Times, they recently ran an interesting interview with Sean Forman, who's the man behind Baseball-Reference.com. Not only is B-R.com the single most indispensable website for baseball nuts, Forman is one of the nicest guys I've ever met. If you're not yet addicted to Forman's masterpiece of a site, set aside a few hours and dive in. With far too many mainstream media members misguidedly suggesting this week that Tom Glavine will be the last 300-game winner baseball will ever see, it was nice to read a well-done argument against that silly, hyperbolic notion, even if it was in the New York Post. One of the many nice things about being employed by NBC is that there's all kinds of interesting work-related stuff to gossip about in the office (if I actually worked in an office, of course). Once upon a time Ubelmann was just another guy who hung out in the comments section here, but then he started to contribute to Stick and Ball Guy's site and quickly became one of my favorite Twins bloggers. If you're not yet familiar with the best Twins blogger who doesn't actually have his own blog, here's your chance. Here's a new blog started by an AG.com reader that's worth checking out: TwiBaskMo. I'm not sure what it says about the future of the comments section here, but I found myself nodding an awful lot while reading this article.